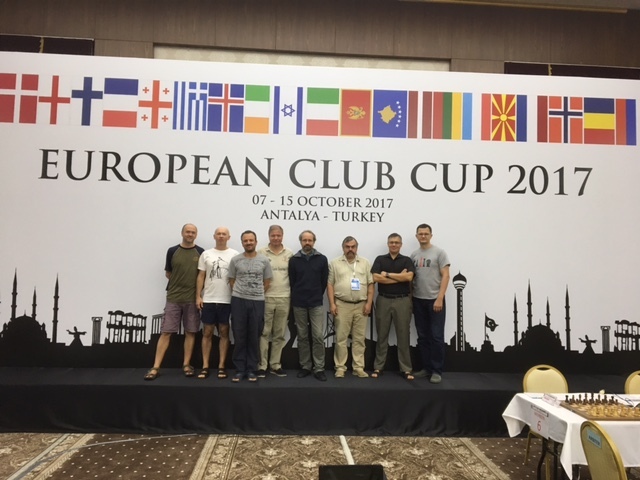 Gambit Bonnevoie has ended its adventure at the European Club Cup in Antalya (Turkey) from 8 to 15 October 2017 on place 26. Our club was represented by GM Marko Tratar, Óskar Bjarnason, FM Jan Bednarich, FM Tim Upton (captain), Zoran Stanić, Roberto Visintin, Rytis Virbalis and Dans Vijups. The “Champions league of chess” saw the triumph of the Russian team Globus with one of the strongest line-ups in the history of the competition (super GMs Kramnik, Mamyedarov, Grischuk, Karjakin, Giri, Nepomniachtchi, Korobov and Khismatullin, average rating 2772). Alkaloid from Macedonia (average rating 2724) and Odlar Yurdu from Azerbaijan (average rating 2634) got silver and bronze, respectively.